Science Objects are two hour on-line interactive inquiry-based content modules that help teachers better understand the science content they teach. This Science Object is the second of three Science Objects in the Earth’s Changing Surface SciPack. 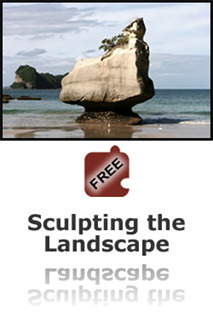 It explores the landforms we see on Earth today and the processes that create these landforms. Landforms are the result of a combination of constructive and destructive forces. The Earth processes we see today, including erosion and the movement of lithospheric plates, are similar to those that occurred in the past. Some changes in Earth’s surface are abrupt such as earthquakes and volcanic eruptions. Other changes shaped in part by the motion of water and wind on weathered rock act over very long times to level mountain ranges and through sedimentation create new forms elsewhere. Upon looking over the Science guide, I found that the information enclosed was relevant, properly organized, and easy to follow. The details and the reviews/reminders truly help the observer to understand the complexities of Weathering and Erosion. The section on rivers was informative with a lot of pictures to help make connections with the materials. The part about the speed of erosion is also great, as it addresses a misconception about how erosion is a slow process.